Ricoh Imaging recently gave Pentax K-1 new firmware update. Version 1.43, the latest Pentax K-1 firmware, was released on November 2017 and it is the third update the popular model receives this year. Pentax K-1 itself was introduced in February 2016 and here is the list of updates the full-frame DSLR get in 2017. 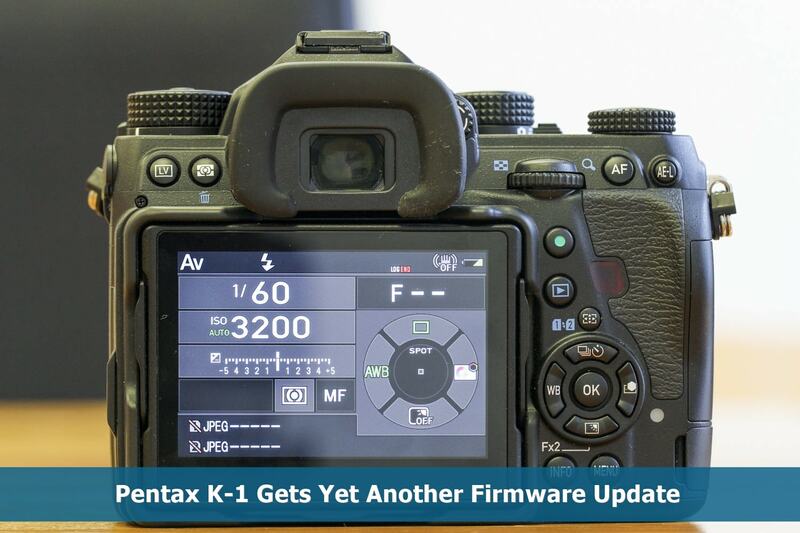 This update was released in April 2017 and up to this date, this is the biggest update for Pentax K-1 firmware this year. This version improves the camera’s tethering functionality. Furthermore, if you have equipped your camera with Image Transmitter 2, there are some great improvements in this department as well. The best thing this update brings is some new settings that now can be changed while tethering. The new settings include white balance, custom image, JPEG recording size, card slot setting, image recording format and many others. Image recording format change function. Recording image quality change function. Live view magnification change function. Focus fine adjustment function for live view. *When this update is done, the contents of version 1.40 and earlier will be also updated. The second update was released six months later in September. Unlike the first firmware update that’s packed with various new features, there is nothing new in version 1.42. This update only fixes some problems with stability in the former firmware version. It is surprising that only two months after the previous update, Ricoh Imaging gives another firmware update for Pentax K-1. But don’t expect too much from this update because just like the previous one, it doesn’t bring any new features. The update only addresses some performance issues, especially in Live View and Movie Mode. Even though there are no cool features you can brag about in the latest Pentax K-1 firmware update, it is still worth to get. Not only it promises more stable performance, it also includes all the great new contents from the prior updates. So, go to Pentax official website immediately and download the latest firmware version to enjoy a better performance from your camera. Press MENU button to display MENU screen. Press the four-way controller right to display [Set-up 4] menu screen. Select [Firmware Info/Options] in the [Set-up 4] menu then press the four-way controller right. The firmware version for camera is displayed on the [Firmware Info/Options] screen. SD card reader or a computer with a SD card slot. Provide a formatted SD memory card for the update software. The download file is self-extracting. The following file is extracted. Fwdc228b.bin: This is the updated firmware. Copy the above Firmware file [fwdc228b.bin] to the root directory in the SD card. If your computer does not have a card slot, you can copy the firmware update file by inserting the SD card into your camera and then connecting the camera directly to your computer. Insert the D-LI90 battery into the camera and confirm the battery is full by battery level indicator then turn the camera off. nsert the update SD card (prepared in step 1) into the camera (slot 1) and close card cover. Turn the camera power on while pressing the MENU button. "Updates the camera firmware" appears in the LCD monitor. Ver: 1.00/1.10/1.20/1.30/1.40 /1.41/1.42→1.43　will be displayed. Press the four-way controller to select "Start" and press the "OK" button. "NOW LOADING" appears on the LCD monitor and updating starts. Please do not under any circumstances switch off the power before the update is completed. When update is completed, the "COMPLETE" will be displayed at the left bottom of the LCD monitor, then turn the camera off. Remove the update SD card from the camera. *Confirm the version of firmware with above [How to check version]. 0 Response to "PENTAX K-1 Gets Yet Another Firmware Update"